Money may make the world go around, but fair values and free markets make it a more enjoyable ride. Recent economic events have thrusted many global economic weaknesses into the spotlight. This category includes works to implant transparency, remove barriers, and internalize costs. The pinnacle of economic sustainability is making market price equal true value. This is how we at Katerva introduce our Economy category, which connects directly with Sustainable Development Goal 8: Promote sustained, inclusive and sustainable economic growth, full and productive employment and decent work for all. 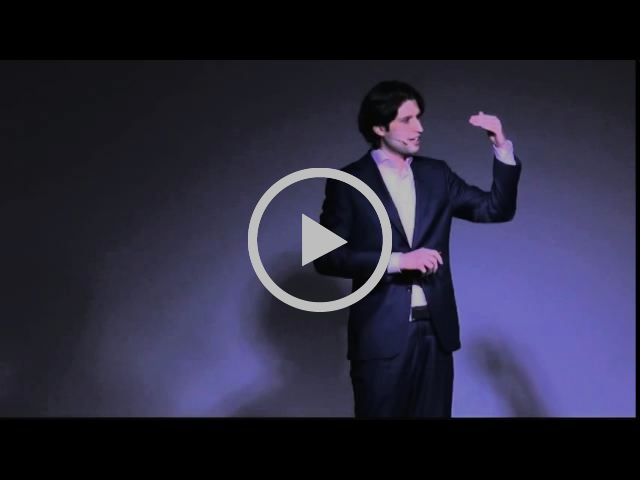 Listen & watch how Founder Adrian de Groot Ruiz explains the idea behind True Price. There are really two aspects here. The first raises the question whether we really measure what matters, the second is about the fact that when pricing our goods we neglect to take two significant factors into consideration: the wellbeing of people, and the wellbeing of our planet. If we are honest with ourselves, we have known about both of these for a while. 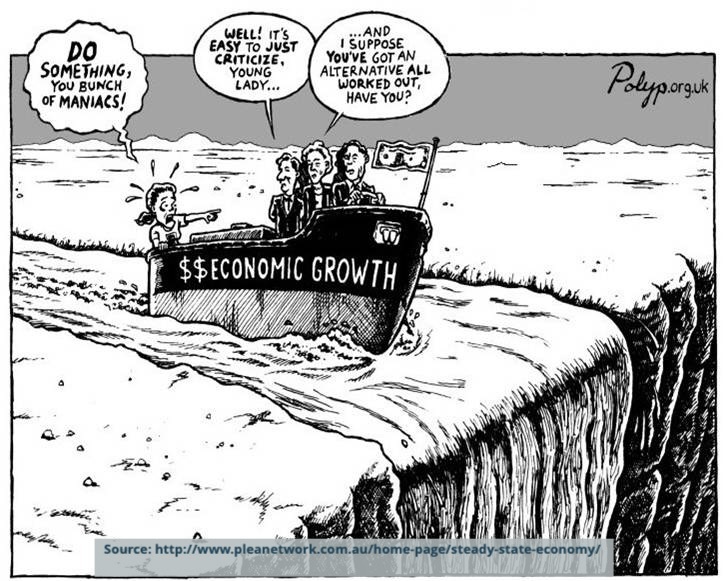 Concerning the first, perhaps we should ask why we started measuring GDP (Gross Domestic Product) in the first place. While the original concept of GDP goes back to the mid 17th century, the modern concept of GDP was shaped in the 30s and 40s of the last century, and was officially adopted to measure a country’s economy after the Bretton Woods conference in 1944. The critical point is that the growth in a country’s economy was considered to be synonymous with the growth in a country’s overall welfare. To put is the other way around, it was assumed that there is a direct link between people’s wellbeing and their standard of living, and that the standard of living can be measured by looking at how much ‘stuff’ people have, ie by counting how many products and services are being produced and consumed. 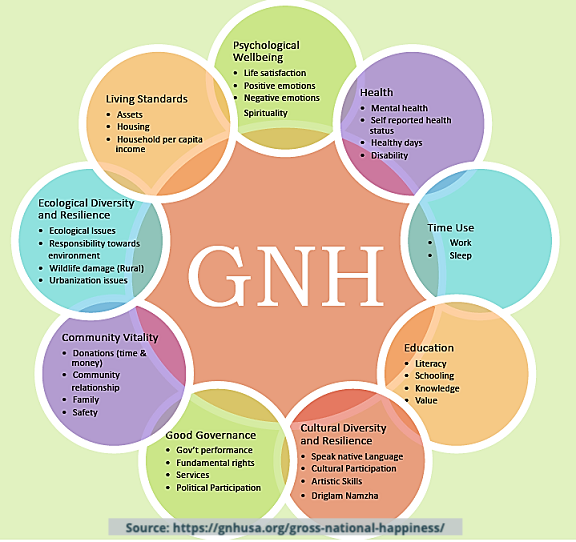 In 2015, building on the 1972 declaration of the king of Bhutan, Jigme Singye Wangchuck that his aim was not to increase GDP, but GNH — ‘gross national happiness’, the then British Prime Minister David Cameron announced that the UK would start to measure happiness alongside economic measures. And indeed, wellbeing has been measured on an annual basis since 2011. Not only are there question marks behind the appropriateness of GDP as a reflection of a nations' wellbeing, reality seems to indicate that feasibility is also called into question: since the most recent financial crises, developed economies have continued to underperform in the three key drivers of economic growth: capital, labour and productivity. Looking at developing economies, where 90% of the world’s population live, the picture is not much more promising. According to the UN, these economies must grow at 7% a year to alleviate poverty, which would result in the doubling of per capita incomes in one generation. Yet even significant economies such as China, India and Brazil, are failing to meet this target. The questionability of the one and only measure for the development of wellbeing of humanity we currently use becomes even more obvious when we look at the second aspect: the fact that we ignore the true cost of our economic output. Our current system fails to address environmental degradation, biodiversity loss, income inequality and the super-rich. What would happen if we pursued economic growth relentlessly is powerfully demonstrated in a graph from WWF's Living Planet Report. 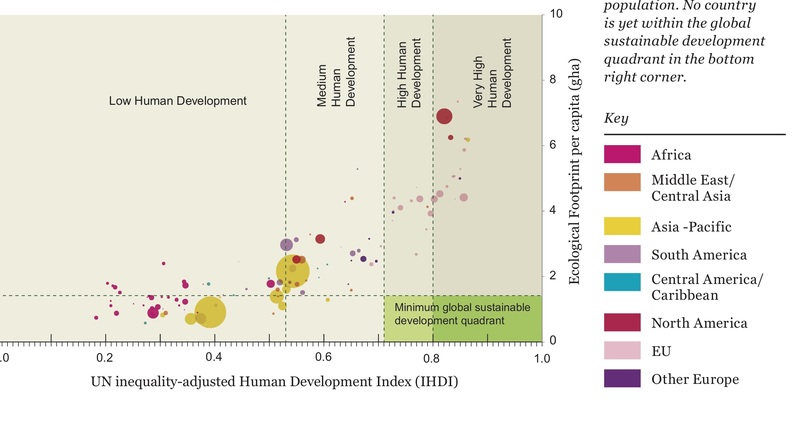 * The graph correlates the Ecological Footprint with Human Development Index, whereby the Ecological Footprint measures the impact of human activities measured in terms of the area of biologically productive land and water required to produce the goods consumed and to assimilate the wastes generated, and the Human Development Index (HDI) is a statistic composite index of life expectancy, education, and per capita income indicators, which are used to rank countries into four tiers of human development. The dots in the graph represent each country are coloured according to their geographic region and scaled relative to their population. By the way, if you want to check out your own footprint, you can do this here. First introduced in 2006, it was very clear that if everyone wanted to live and consume like the people in the United States (the big red blob), we would need four planets earth by 2020. The only place on that graph that would be truly sustainable, both from an environmental and a social justice perspective is the light green colour in the bottom right corner - and as you can see, no country is in it! Cuba used to be in there as they were investing heavily in health and education while consuming relatively little, but since opening up to the outside world they too have moved out to that quadrant. By 2014 the standard HDI had been replaced by the Inequality-adjusted Human Development Index (IHDI) which combines a country's average achievements in health, education and income with how those achievements are distributed among country's population by “discounting” each dimension's average value according to its level of inequality. You can see that many countries have slipped back on the Human Development Index once it had been adjusted for inequality, and even in the 4 years between these two graphs, resource consumption has increased for most, if not all, countries. This clearly is not sustainable. One critical fist step is that we must move beyond neoclassical economic theory that is increasingly debunked in favour of a vision that is more open, complex and dynamic. *** Kate Raworth, author of “Doughnut Economics”, argues that we must redesign money, finance and business to be in service of people; and create economies that are regenerative and distributive by design. **** You can watch her lay out the arguments in this RSA video and explain how 21st century economics could work in these short animated videos, the first of which you can see below. Preserve natural capital - Restore damaged ecosystems, halt the loss of priority habitats, significantly expand protected areas. Produce better - Reduce inputs and waste, manage resources sustainably, scale-up renewable energy production. Consume more wisely - Through low-footprint lifestyles, sustainable energy use and healthier food consumption patterns. 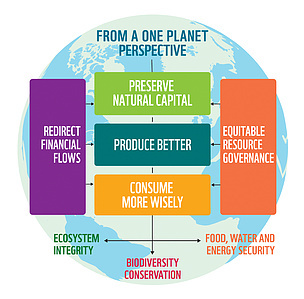 Redirect financial flows - Value nature, account for environmental and social costs, support and reward conservation, sustainable resource management and innovation. Equitable resource governance - Share available resources, make fair and ecologically informed choices, measure success beyond GDP. Preserve natural capital - Excess Materials Exchange is a company that turns waste into something valuable, marketed as a “dating site for secondary materials”. Contributing to a circular economy, whereby a product life ends in regeneration rather than disposal, is a leap in the right direction. Produce better - along similar lines to the above, Reverse Resources is closing a loop for wasted fabrics and fibres from garment production - on average 25% of material gets discarded from factories. Reverse Resources have developed a platform that provides virtual support for both the factories and the buyers to make a mutual agreement on how to close the loop together and hold on to that agreement transparently, leading to long-term gains for all stakeholders. Consume more wisely - Folia Water produces germ-killing nano-silver coated paper filters that basically eliminate bacteria. This helps healthier living in areas where access to clean water is a challenge. Of course Winnow, our 2018 Winner of the Behavior Change category, is also an excellent example: they use AI technology to help reduce food waste in professional kitchens. Redirect financial flows: 2017 winner, Mobisol, offers easy-to-use solar home systems for low-income people, with an innovative pay-as-you-go scheme, using mobile banking services. Besides providing clean power for thousands of insufficiently served rural communities, Mobisol creates economic opportunities by electrifying small businesses or through the resale of extra energy. Equitable resource governance - Brasil® origins, based in Brazil, acts as a connecting link in a collaborative network that promotes ethical, transparent and balanced trade relations. Brasil Origins links those who produce and those who buy, with an aim of generating positive impacts on local populations and their territories. Of course one of the key goals of the 8th SDG is to provide full and productive employment and decent work for all, here too our nominees lead by example. NaTakallam, also a 2019 nominee, helps to connect refugees to remote work opportunities in the language sector. If you are looking for more inspiration, for stories that show what is possible rather than bemoan all the had things that might happen, watchTomorrow, a movie in which Filmmakers Mélanie Laurent and Cyril Dion travel worldwide to investigate specific solutions to environmental and social challenges . The biggest challenge is, how do we restructure the economy at a rate that is fast enough to reverse the damage that has already been made to our environment and societies? If you know any exciting innovations that lead the way, and help us create an Economy that make our world a better, more sustainable place, let us know! ** To delve deeper see WWF One Planet Living from 2016. *** You may want to read the 2014 McKinsey article on Redefining capitalism for more . 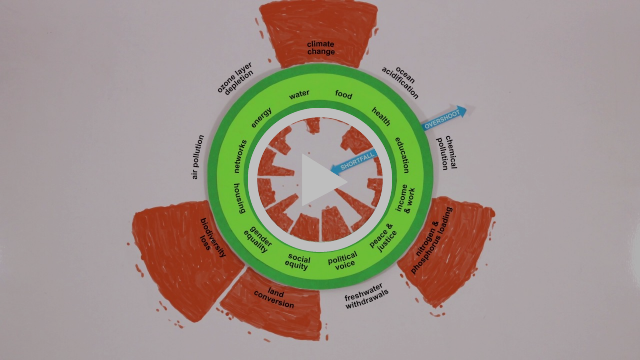 **** By the way, Kate Raworth Doughnut Economics is referenced in 2016 WWF report. You may want to check out this 4 min summary [https://fourminutebooks.com/doughnut-economics-summary/] of her book.